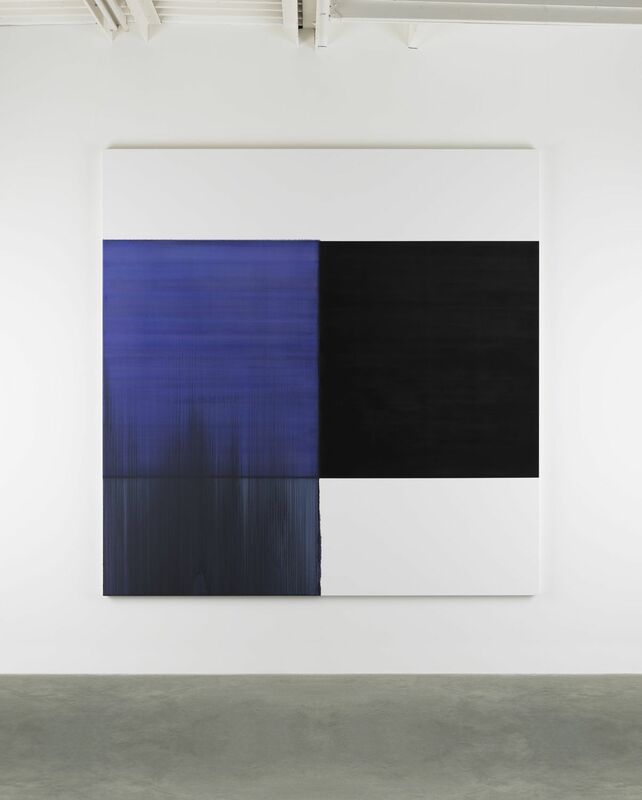 Frith Street Gallery is pleased to announce an exhibition of new paintings by Callum Innes. One of the most important painters of his generation, Innes is known for a practice that combines intellectual rigour with incredible sensitivity to his chosen medium. This exhibition focuses on works from the artist’s celebrated Exposed Paintings series. This series played a central role in Innes’ seminal presentation at 2014’s exhibition Generation: 25 Years of Contemporary Art in Scotland. The Exposed Paintings are explorations of colour and pictorial space, and are created through a process of addition and subtraction. Progressive layers of oil paint are applied to a section of the canvas’ surface, creating a dense, black field. The artist then removes a section of this layer using turpentine to reveal the constituent colours beneath, and the residue of this process stains the canvas with veils of pigment. The large paintings in this exhibition are composed of approximately 7 individual layers of paint, many more than in previous similar works, and so they achieve another level of luminosity and movement. Callum Innes was born in Edinburgh in 1962. He was short-listed for the Turner and Jerwood Prizes in 1995, won the prestigious NatWest Prize for Painting in 1998, and in 2002 was awarded the Jerwood Prize for Painting. He has exhibited widely both nationally and internationally and his work is held in public collections worldwide including the Guggenheim, New York; National Gallery of Australia; TATE, London, Musée national d’art modern, Paris and Scottish National Gallery of Modern Art.